Businesses have agreed on a planned minimum wage hike, details of which are to be settled by mid-month, but they argue that the increase should not be imposed at the same rate nationwide. They also warn that the 3 million small and medium-sized enterprises (SMEs) and the farm sector will be hit hardest by the higher wage, as they are less likely to adjust quickly to rising costs. Kalin Sarasin, chairman of the Joint Standing Committee on Commerce, Industry and Banking (JSCCIB) and chairman of the Thai Chamber of Commerce, said the committee had already sent an open letter to Prime Minister Prayut Chan-o-cha to express concerns about a possible rise in the nationwide daily minimum wage by 2-15 baht from the current 300 baht. He said the wage hike should also be based on economic conditions, business size, per capita income and employment in each province, while local wages should be determined by provincial wage committees that represent employers, employees and the Bank of Thailand, or related local panels to be chaired by governors. According to the National Statistical Office, there were 37.72 million people employed in 2017, 12.05 million of whom were in the farm sector, 14.79 million in the manufacturing sector and 10.88 million in the service/trade sector. There were roughly 3 million SMEs last year, employing 11.7 million people. Mr Kalin said the 12.5 million people in the agricultural sector might also feel the pinch from rising costs and not enjoy any direct benefit from an increase in the daily minimum wage. Poj Aramwattananont, vice-chairman of Thai Chamber of Commerce, said manufacturers also support the government’s policy to raise the minimum wage, but he suggested the increase should be determined by the provincial committees. The increase in the daily minimum wage will negatively affect higher cost of living and competitiveness, Mr Poj said. Chaichan Charoensuk, secretary-general of the Thai National Shippers’ Council, said that with labour costs making up 10-20% of production costs in labour-intensive industries, the food and farm-related sector will be hit hardest by the higher wage. “We’ve proposed that the government and related agencies consider postponing the wage hike plan for another year because it is not yet the right time for the wage rise,” he said. Chen Namchaisiri, chairman of Federation of Thai Industries, said the FTI also wants the government to reconsider the issue because the rise may render a negative impact on Thai SMEs and local farmers because they cannot afford to pay higher rates. “The rise of the minimum wage should be on a par with the cost of living, inflation and economic status in each province,” he said. Mr Chen said the government should not intervene in the wage hike, as any wage hike is a sensitive issue that may negatively affect other sectors. In related news, a key labour group is calling for equal rises in daily wages for all provinces, saying disparities in minimum wage hikes will not only be unfair but will also result in migration of workers from areas given low wage rises to ones with higher wage rises. 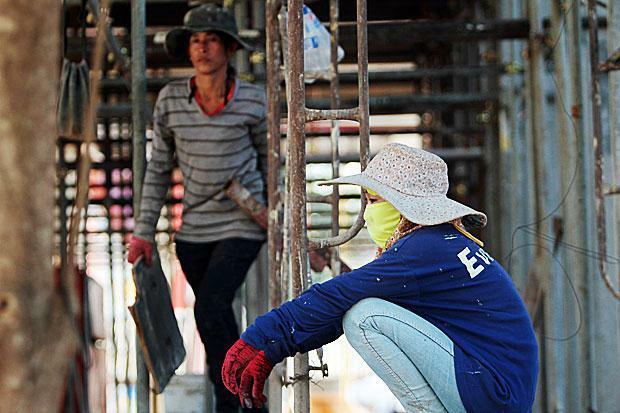 The Thai Labour Solidarity Committee (TLSC) announced yesterday its call for the central board approving wage hikes to adopt an equal rate of wage hikes at the meeting scheduled for today to decide on the wage hikes. If those large cities are given a greater hike in daily minimum wage, while smaller cities get a lower rate, many workers in smaller cities will be migrating to the large cities for better pay, said TLSC president Sawit Kaewwan. This tendency will result in a situation in which small cities will encounter shortages of labour while the large cities will be crowded with workers attracted to the cities for better pay and yet end up struggling to cope with high living costs and other related problems, Mr Sawit said. Currently, there are four rates of daily minimum wage used in different parts of the country, he said, adding that the rates are 300, 305, 308 and 310 baht. Mr Sawit blamed persistent disparities in the minimum wage rates on the unfair composition of the provincial wage subcommittees that are supposed to consist of an equal number of members representing three sides: employers, employees and state officials. But in the election of these subcommittees, those members elected in the quota of the employee side turn out not to be real representatives of the workers, he said, affecting subcommittee decisions when deciding on minimum wage hikes.